There is no doubting how easy it is to transform the Donkey from single to double, you just unclick a couple of catches and pull the frame to create a wider frame. 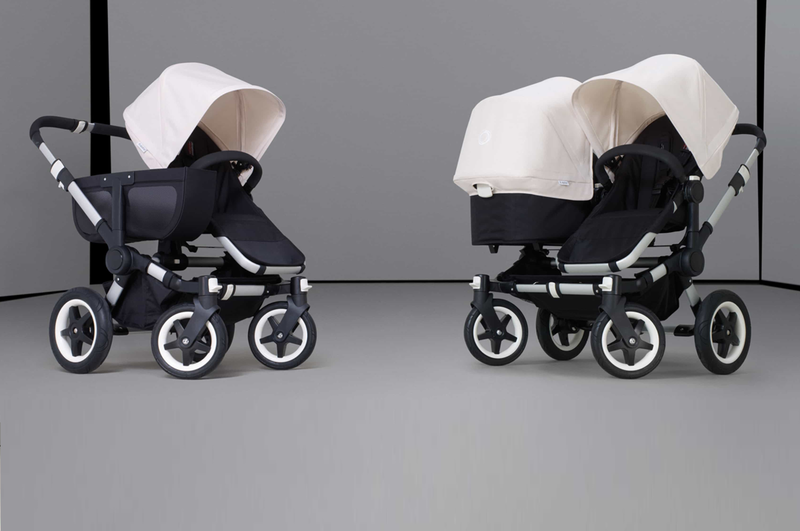 You can have the seats in a variety of positions – Twin mode, two carry cots, seat and carrycot, parent and world facing. One of the key features for me is the size of the underneath basket, its huge and when in single mode you have an additional basket which is really handy, but my little one kept leaning over and grabbing things, all fun and games. Tires do require a pump, so you are risking getting a flat whist walking the dog. The wheels and suspension do both deserve a mention, If your looking for a pram that is suitable on all terrain and is ideal for twins or a pram that will grow with your family this might just be what you are looking for. In single mode it was great for getting on public transport but in double it was a little more tricky. I had to leave the house and set up outside for duo mode, fine in the Summer months but maybe a nightmare in the Winter. The seats are more narrow than most standard prams but still plenty of room. Edward 9 Months and Polly-Ann 2 both were very comfy.